IconsFacebookInstagramRedditTwitterHatchimals - Who will you hatch? Open up the sparkly 6-Pack Shell and discover Hatchimals CollEGGtibles that change color underwater! Exclusively available at Walmart, this 6-Pack lets you collect cute characters from each Season 5 Hatchimals family! To start hatching, lift the pink, shimmery lid and lift out the super-pretty seashell-shaped eggs. Using your love and care, rub the purple heart on each egg until it turns pink. Gently press down to crack the shell and discover your new friend! To see your Hatchimal change color, dip them into warm water. What color will they turn? Once you've taken your Hatchimals for a swim, tuck them back into their nests and use the pearly Shell Case for displaying, playing or hatching on the go! Close the shell and it becomes a pretty carrying case, perfect for taking your Hatchimals everywhere! To make these cases extra special, each one comes with a pearly sticker sheet! Use the Season 5-themed stickers to make your case totally unique! 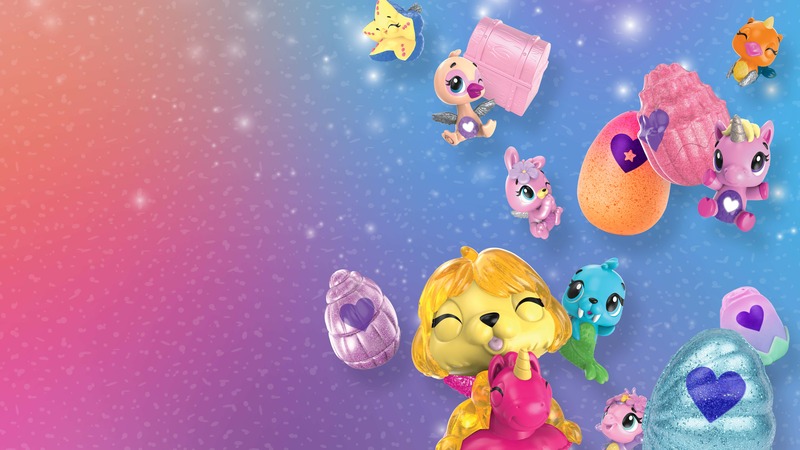 Hatch a whole underwater world with the Hatchimals CollEGGtibles 6-Pack Shell! 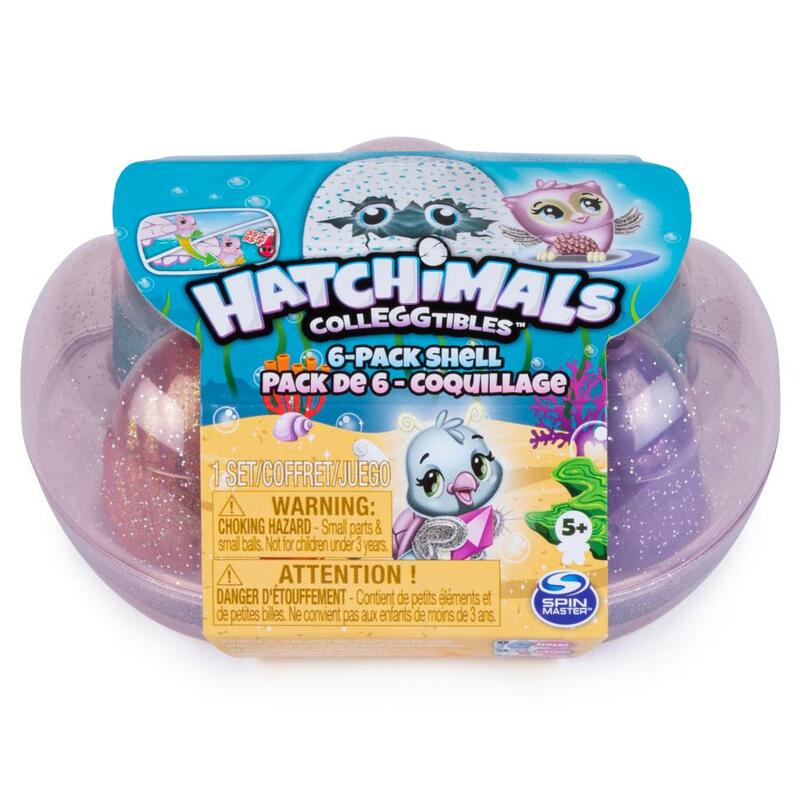 HATCH 6 HATCHIMALS COLLEGGTIBLES: Add Hatchimals from each Season 5 family to your collection with this exclusive 6-Pack Shell! Lift the pearly lid and you'll discover 6 seashell-shaped eggs! Use your love and care to rub the purple heart until it turns pink, then gently crack the shell and meet your new friends! DIP IN WATER TO CHANGE COLOR: Your pearly Hatchimals change color underwater! Dip your new characters into warm water - what colors do they turn? COLLECT A PEARLY CARRYING CASE: This pretty pearlescent case makes it easy to hatch on the go! Place your Hatchimals in the cozy nests and close the glittery lid to take them with you! The Hatchimals CollEGGtibles 6-Pack is a great gift for kids aged 5 and Up. Use the shimmery sticker sheet (included) to customize your case and make it totally unique!